How can I save money when the heating bills continue to increase? This report, Winterizing Your Home (Simple Steps to Money Saving Ideas! ), will show you how you can stay warm and save money at the same time! No more frustration over costly heating bills as you and your family try to stay warm during the winter season. It’s such a convenience to have heat in your home. However, when that bill comes, it’s a totally different story. Sometimes you wish you could just burn it; but you know you have to give the utility company what is due to them for servicing your home with heat. There are plenty of secrets and other tips in this report that can help you get and keep your money’s worth. 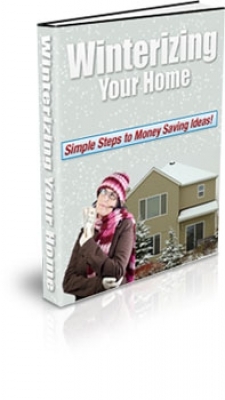 You will be amazed at the amount of money you can save while still keeping warm in your home.